My name is Matthew Tikhonovsky. I am an Eagle Scout from Troop 955 in Marietta, GA, and a rising junior at Living Science Home Studies. 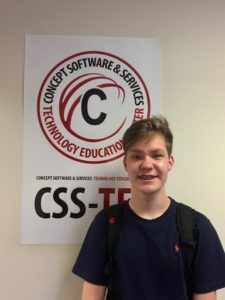 This summer, I was honored to receive an internship at Concept Software and Services Inc., a technology firm located in the up-and-coming Alpharetta tech hub. Remarkably, my internship experience allowed me to take the skills I’ve learned in Scouting and apply them in a real-world setting, presenting me with the opportunity to utilize Scouting skills in the technology workplace. During my month-long internship, I could not help but draw on my scouting skills when I worked on projects and collaborated with fellow interns. I utilized the communication skills that Scouting has taught me when I participated in round table discussions and pitched newsletter ideas. Likewise, I used the leadership skills I developed as the Senior Patrol Leader of my troop when I spearheaded blog post projects and advertising campaigns. And lastly, the work ethic that Scouting has ingrained in me allowed me to work on multiple projects at the same time and churn out numerous articles ahead of time. Remarkably, Scouting has equipped me with skills that are applicable not only in the troop setting. The 5 years that I have been involved in Troop 955 and Scouting at large have taught me invaluable and intangible skills that enable me to “Be prepared” not just on camping trips and troop meetings, but also allow me to “Be prepared” to accomplish projects in the workplace. This post was submitted by Matthew Tikhonovsky, an Eagle Scout from Troop 955 in Marietta, GA.